Imagine adrenaline-fueled defiance of speed and the desert dunes! 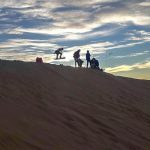 This is sand boarding, the extreme sport that has been gaining popularity across the globe and which you can now enjoy on Puerto Peñasco’s dunes. 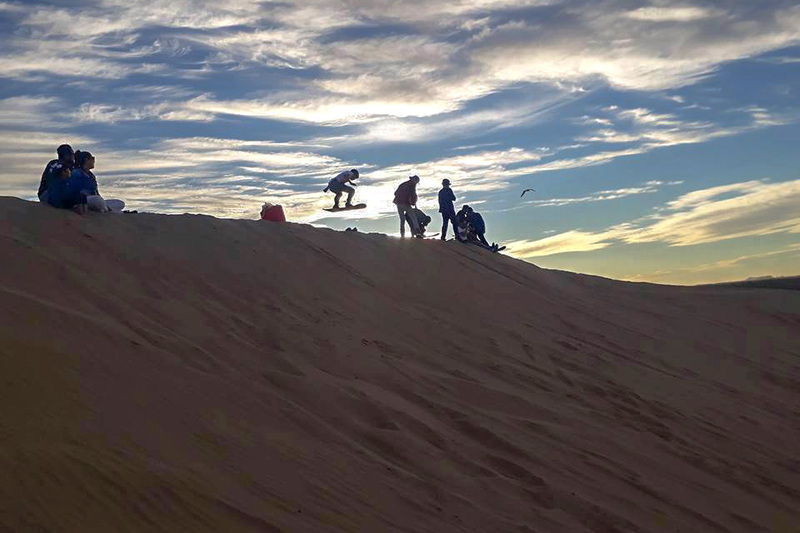 Here in Puerto Peñasco, sandboarding opportunities can be found on dunes near the Shuck Toak Visitor’s Center of the Pinacate Biosphere Reserve, as well as on sand adjacent to local oyster farms, and along Sandy Beach. Sandboarding can only be done in areas where nature has provided generous mounds of fine sand. In Puerto Peñasco one has the added benefit of taking in the spectacular scenery of estuaries and desert landscapes as you glide down a dune. People of all ages can experience the adrenaline of sandboarding, as adventurers range in age from young children to older adults. It is key, however, to rent a board just in case you don’t have your own, as well as make sure not to damage any local flora or fauna. Plus, if you’re out for a day of sandboarding please remember to “trek it in, trek it out,” and help keep the dunes clean! For more information, contact RP Sand Crew at 638 384 0216.